This low profile green laser sight works great for your subcompact or compact pistols, with rails. ➢ This green laser sight is extremely low profile, yet powerful, designed to fit any rail-equipped pistols including subcompact pistols. ➢ The green laser is brighter and more easily seen in the daytime than any red laser. 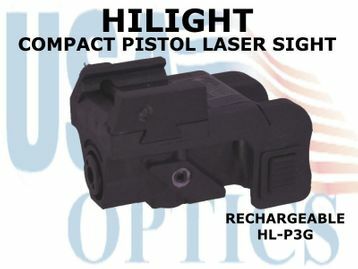 The smallest and the brightest green laser sight offered by HiLight meets US law requirements (5mW peak, 532nm, Class 3R). ➢ This green laser sight is powered by a built-in rechargeable battery. » Weight - 1.2 oz.